When it comes to professional athletes, almost all of them have another individual or team that they tend to struggle against. When it comes to Montreal Canadien netminder Carey Price, that team is none other than the Edmonton Oilers. As odd as it may seem, the former Olympian has managed to beat Edmonton just once in seven career appearances. As a matter of fact, Montreal has actually gone out of their way to keep the 28-year old away from facing the lowly Oilers in each of the previous two seasons. During his 2014-15 Vezina Trophy winning campaign, Price was nothing more than a spectator in the clubs two meetings, as he watched Edmonton beat Dustin Tokarski on both occasions. In 2013-14, Michel Therrien decided to go with Peter Budaj when the Habs paid a visit to Rexall Place in early October and the veteran netminder continued his dominance over the Oilers with a 4-1 win. However, when the two sides renewed acquaintances later that month in Montreal, Price was outplayed by Devan Dubnyk in what was a rare victory during the opening month of the Dallas Eakins era. 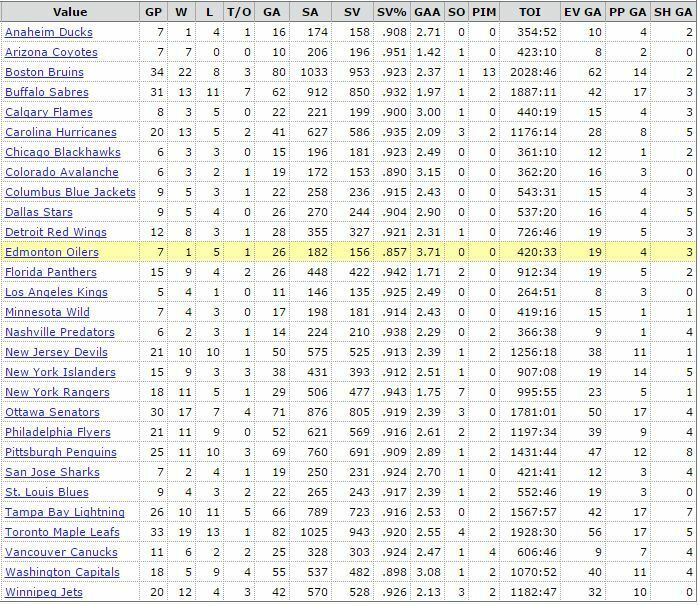 Remember, we are talking about the Devan Dubnyk who was in the midst of career worst run and not the guy who has resurrected said career with the Arizona Coyotes and Minnesota Wild. No matter how bad the Oilers have been, they tend to always find a way to end up on the right end of the final score against Price. With the Habs coming off their first loss of the season to the Vancouver Canucks and back-to-back games with Edmonton and the Calgary Flames scheduled for tonight and Friday evening, one can’t help but wonder if the league’s best netminder will be given the opportunity to put some demons to rest. Oil 14-4-3 in their last 21 meetings w/MTL, who, facing a back-to-back, could start Mike Condon instead of Price (1-5-1 vs EDM, 3.71, .857). While the smart money would be on Therrien using Mike Condon against Edmonton and then go back to Price against the Flames, do not be surprised if we happen to see the Canadiens No. 31 standing in between the pipes at Rexall Place. Believe me, there is no question that the fifth overall pick of the 2005 NHL Entry Draft is well aware of his record against the Oilers and would love nothing more than to get that monkey off his back. Add to that the fact this would be his first chance to go head-to-head with Connor McDavid and something tells me Carey Price is expecting to get the start against Edmonton. With the Oilers currently “riding” a three-game losing skid and their history being what it is against Price, something is going to give and hopefully we get a chance to see how it all plays out. One thing is clear, no matter who starts in goal for Montreal, you can count on the atmosphere being electric over at Rexall Place…as it usually tends to be when the Canadiens come to town.